Normally I’m not the kind of guy to like inclement weather. Sure, I’ll ride in the rain or a good thunderstorm, but I like a good bright fall day the best. But when the Showers Pass Amsterdam jacket arrived, it got me wishing for rain, sleet or snow. That’s because it’s my favorite mix of functionality for cycling and style for off-the-bike endeavors. Cut more like a fine jacket (albeit a jacket that fits best when bent forward in the drops) the Amsterdam has a soft shell interior and a herringbone exterior that’s thicker than the company’s Portland jacket. After a few weeks of really spectacularly un-fall-like weather (highs in the 60’s, bright sun, clear skies) we finally got some cold, wet days. I put on the Amsterdam and hooked my bike to my son’s trailer and hit the roads. The Amsterdam jacket feels great, it’s one of the nicest fitting pieces of clothing I’ve seen and it look great off the bike as well. In a coffee shop, at the grocery store, I look less like a Lance Armstrong and more like a Daan de Grot. That in fact might be the one weakness of the jacket—it’s not incredibly visible. For city-goers that’s not a big deal, the 3M reflective striping and the flip-down rear reflective panel are perfect, but I wouldn’t pick the Amsterdam on a long, solo ride on a dark country road. Of course, that’s why they named the jacket after a major cycling city and not some forlorn route up the Ozarks. Everything on the jacket is meticulous crafted, from the hidden zippered pockets (one with an audio port) to the pit zips that provide tremendous ventilation when the jacket proves to be too warm, which is pretty quickly on a warmish spring day. 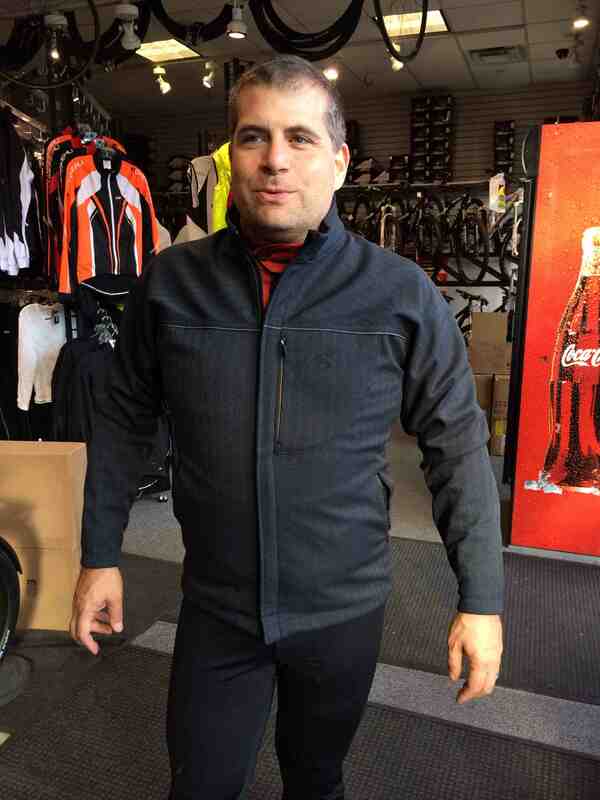 The jacket runs $200, which puts it on point with a lot of winter gear and well below well-taylored pieces from companies like Castelli and Assos, none of which look as good off the bike.